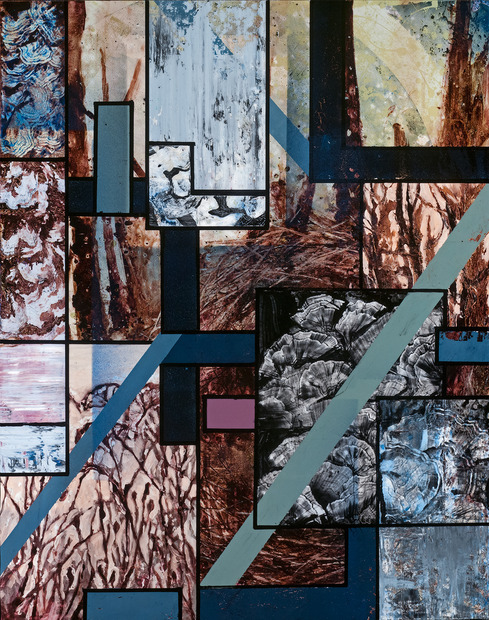 Jake Kelley, Never Mind the Faded Forests, Never Mind the Silent Fields, acrylic, latex, polyurethane, ink, wood stain, resin, and screen-print on aluminum, 38”x 28"
Jake Kelley was born and raised in Chattanooga, TN. He is a graduate of the University of Tennessee at Chattanooga where he received a B.F.A. in Painting/drawing and a Master’s degree in Education. Mr. Kelley has exhibited widely and received many awards in his hometown, which is recognized as an important cultural hub of the “new south”. He was awarded “best emerging artist 2008” and was the “Featured Artist 2013” at the nationally acclaimed Four Bridges Art Festival. My work is primarily an exploration of materials in an effort to create images of lasting conceptual and emotional effect. I utilize a wide variety of mediums and techniques that have developed organically from hours of experimentation. My process, which involves the layering and removal of a variety of material and the simultaneous revealing and covering of visual information is informed by the collage techniques of early-mid Modernist painters such as Picasso, Motherwell, and Krasner. I am also interested in mark-making as a method of exploring the inherent tension between opposites such as Euclidian/Platonic, organic/geometric, painting/drawing, etc. As an abstract painter, engaging in a cultural dialogue is also a concern. Therefore, the shared human experience as well as perception itself is always primary subjects. I found the process of translating another artist’s work (in a different medium: sculpture) to be an interesting and inspiring process. As an abstract painter, I tend to “borrow” visual imagery from a variety of sources and utilize its inherent abstract characteristics (such as pattern, color, shape, rhythm) to create compositions that are indeed abstract, but reference and allude to the shared human experience. In this case, I chose to emphasize the conceptual and visual tension between the organic yet naturally rhythmic forms from the previous art work (silhouetted trees, fungus, spores, etc.) and the geometric structure of the framed display case. I found this thematic restriction to be useful as a catalyst for discovering new processes and modes of creation.